The obligation of ‘Safety’ in the workplace can take many forms. The line, so to speak, of where that obligation lies, can be rather fuzzy. On one side of the line, regulations and compliance requirements make it crystal clear what should and shouldn’t be done in certain circumstances i.e. OSHA requires hard hats at construction job sites, period. On the other side of the line, there are often things that contribute to a safe environment, but are not necessarily a firm safety requirement i.e. the degree of light in a work area. In that fuzzy space in the middle, between what you must do and what you know you should do, is the ‘Standard of Care’. ‘Standard of Care’ may be best described as those things that you know you should do, but if you don’t, there may be consequences. There are no OSHA requirements, laws or regulations in this particular space, but there may have been enough precedent set for a certain standard or behavior, that not providing such can open a big box of risk and litigation. The placement of AEDs in public places may be the best example of this. It’s widely known and accepted that AEDs save lives. In the case of Sudden Cardiac Arrest, which we learned in last month’s article strikes roughly 1,000 people every day; rapid, quality CPR and the application of an AED has been shown to increase survival rates 10 fold (from roughly 5% to over 50%). However, outside of airplanes, airports and most government buildings, the federal requirement to have an on-site AED does not exist. Many states have adopted their own regulations requiring the placement of AEDs in some other places i.e. fitness centers in California, dental offices in NY, buildings over 50,000 sq. ft. in OR. While these requirements are clearly saving lives, it’s only a drop in the bucket for places that are affected by SCA. 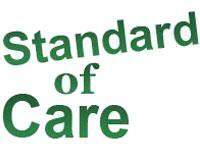 And it begs the question…..Are we moving in to that fuzzy area of ‘Standard of Care’? With regulations non-existent in places like, mines, churches, yacht clubs, most schools, restaurants, buses, subways, hotels, retail shops, gas stations, rest stops, and most offices (etc. etc. ), does that mean that an AED is not expected? If some locations of an organization have AEDs and others don’t, is there a ‘standard of care’ expectation that has been crossed? And ‘so what’ if it has? While each case is different and open to varied interpretation, recent incidents with AEDs would suggest that the ‘Standard of Care’ is a line in the sand that begets a high level of obligation, preparation and management. There are certainly volumes of opinion and legal briefs that could accompany this topic, which I will leave to those experts. The nice thing is, it doesn’t have to be a regulation driven decision with fear of litigation as the major motivator. Compliance with the Standard of Care, no matter the specific topic, will likely save lives, reduce your risk and make you feel good because of it. If all that hits home and you’re convinced it’s the right thing to do, it then comes down to money. If that is a challenge, as it can be for many in this space, there’s not a better place to get your AED than www.AEDGrant.com. Check this resource out as an alternative to more traditional avenues and feel good about your purchase, as well as feeling good about meeting the Standard of Care.